I recently wrote about the Lizzie Bennet Diaries, and today I have another very unusual Pride and Prejudice retelling…Lost in Austen by Emma Campbell Webster. If you’ve heard of the movie by the same name, they’re related but not actually remotely the same. 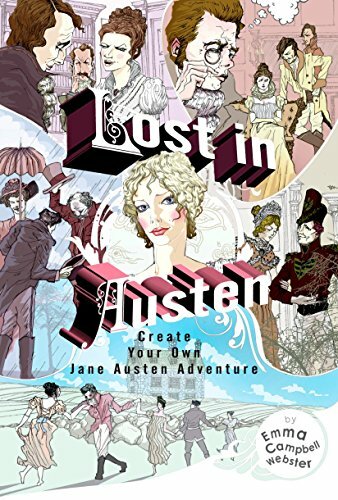 The book is a choose-your-own-adventure through Austen novels. Written in the second person (you, your), the story begins in the familiar opening pages of Pride and Prejudice, with Mr. Bingley recently moved to the neighborhood and “your” mother eager to introduce “your” sisters to the eligible bachelor. But very soon you start having choices—which path will you take to Mr. Bingley’s house? Will you speak to Mr. Darcy at the dance or remain silent? And as the story goes on…will you accept this marriage proposal or that one? Will you confess your family’s scandal to Mr. Darcy or keep it secret? And in the end…will you achieve your mission of a successful marriage? I didn’t exactly read this in the proper choose-your-own-adventure way—because I wanted to read all the different paths! This involved a certain amount of multiple bookmarking, but it actually is possible to do without too much of a headache. The book stays overall along the course of Pride and Prejudice. If you choose differently then Elizabeth did, it usually leads within a few choices to death or dishonor (or both), ending that pathway, so you can go back and choose again. Or—it leads to a “divergence” into another Austen novel. You as the heroine can reach opportunities to marry Mr. Knightley, Colonel Brandon or Captain Wentworth (and quite a few of the men in Pride and Prejudice too). On that subject, can I just remark on how disappointed I was that there was no opportunity to marry Mr. Tilney? If I fell into the world of Austen novels and could go gallivanting between stories flirting with the various heroes, I would definitely be on the lookout for affable and novel-reading Mr. Tilney! Anyway. Those side stories do eventually wrap back into the main plotline (barring death, dishonor or marriages of varying degrees of happiness). A lot of the fun of this book is seeing how different bits of story from separate novels are all woven in together. I’m also fascinated by stories centered around different choices having different results (think Sliding Doors) and while this is a mostly silly example of that, there are some genuinely intriguing twists and turns. What if Elizabeth had told Lydia about Wickham’s true character? What if she hadn’t told Darcy about Lydia running off with Wickham? Choices and different paths! This book is a lot of fun when there are choices—it drags a little bit when it gets too long with just straight reading and no new paths to try. At times this becomes a summarized version of Austen and kind of dry as a consequence—but mostly the choices come frequently enough to keep things engaging. And even that summarized Austen does come with a snarky narrator making asides and sarcastic comments, so that lightens things too. If I have one other complaint, it’s that it’s surprisingly hard to get a happy ending. Which would be fine…except that I felt like some endings should have been happy and were made unnecessarily negative—marrying Captain Wentworth, for example (and again—no Mr. Tilney option?) But the ride along the way was entertaining—and most of the “sad” endings were tragic in a hilarious, overdrawn way. You probably have to be a pretty serious Austen fan to enjoy this one…but if you’ve read Pride and Prejudice and know a few other Austen stories, it’s a fun, distinctly unusual way to revisit the novels. Sounds like a unique way to look at Pride & Prejudice, for serious Austen fans! Intriguing — you’ve whetted my appetite.